Iz, as you may be shocked to learn if you've been reading this blog since I was dithering over whether to put her in kindergarten or first grade, will be going to high school in the fall. HIGH SCHOOL. Which means avalanches of shock and denial on my part. What the hell, people? She is almost as tall as me, definitely more athletic and academic than I ever was, and -- based on superficial factors -- certainly more likely to leave a trail of broken hearts in her wake. If she wasn't so damn cheeky I'd be mired in appreciative rather than irritated disbelief at the marvelous being Seymour and I spawned. But before she hits the big grades, she'll be graduating from eighth grade. Next month. There will be a ceremony. Which is apparently a much bigger deal than it was when I hurriedly tossed on my lone Jessica McClintock frock and sat blinking in the Anaheim sun, alternately taking Disc camera photos of my friends, and family -- including my brother Chet, who had just finished his first year at the USMA, looked very handsome in his uniform, and made all the girls squee. It was fun, but it was not a source of stress. Things are different for Iz's peers, apparently. As Iz informed me yesterday, "all the girls" now get their hair professionally did for 8th grade grad. To which my reply was a parent-censored version of WTF. Really? Professional styling for thirteen year olds? I don't have a problem with girls of any age occasionally getting their hair or nails done at a salon, as a treat. I do have a problem with kids expecting those services as their right, especially with entitled attitudes that include declaring, as Iz did, that it shouldn't be a big deal because it's "only 35 dollars." As if she had 35 dollars lying around. And not as if she asked what she could do to earn said $35 (though she did, later, after the top of my head blew off and she realized she needed to rethink her strategy). As if we hadn't had a conversation just the month before -- after one of her cousins offhandedly described a non-essential cost as being "only $50" and I almost fell over -- about the difference between understanding a good deal, and not understanding the value of goods and services or of currency itself. It's not as though she doesn't know how to do her own hair -- she spends hours each day straightening and molding and manipulating her tresses, with mostly impressive results. And it's not as though she doesn't have a mother and friends and auntie-friends like Jennyalice and grandmothers who have Hair Skillz at her disposal. But for some reason, she seems to think her hair won't be "right" unless it's done the way her friends are getting it done. I suppose I'm mostly dismayed with what I see as a continuous cultural shift away from self-reliance and towards dependence on professional services when it comes to self-care. But maybe this is just the way her generation will be? Maybe it's a California thing? Maybe a cultural thing? She'll look great either way. But does a 13 year old girl really need professional hair styling? My gut tells me no. 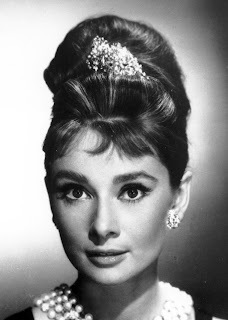 But I'm not living her life, I'm revisiting mine -- as someone who loved figuring out how to create Audrey Hepburn updos, What's New Pussycat straight red sheets, and Veronica Lake peekaboos all on my own. Am I expecting too much? Is this just what kids do these days? We were supposed to have two dresses for our graduation: one for the ceremony and one for the dance right after. My parents said I'd do fine with one dress, and I did. :-) For my wedding, people were impressed I didn't have my hair professionally done. I ended up looking like ME as a bride rather than uncomfortably someone more plastic. Well, I'm eagerly awaiting the update on what you decide to do with this one. This is one of those "I would never . . . ." minutes that I, as a parent, think I need to think about, rather than sloppy assumptions. That being said, I can't imagine that Iz needs her hair professionally styled to look absolutely fabulous. For some people it makes a difference, but not for beautiful 13 year old girls. I remember being that jealous girl... My parents bought me a new fancy dress (with puffy sleeves and a sweetheart neckline, it was 1990) so I was ok on that front. I didn't like that the other families seemed to be making a much bigger deal about it than my own. It finally sunk in when my dad said "Look. this is the only graduation some of these families ever get to go to. To them it is a big deal. You'll graduate high school which will be a bigger deal." Not directly helpful on the hair front, but it was helpful for me on the peer pressure front. Squid, I am once again thankful that you go before me in these things. You and Seymour are raising a beautiful human who is open-minded, and inquisitive, and mostly grateful, and always kind, so I'm sure you will make the best decision in this case too. I vote for making her work for the professional hair-do. Sadly it will probably not turn out how she wants, but that disappointment will then save everyone money from 8th grade-on. Darling daughter had hair professionally done for 8th grade graduation, but no new dress -- wore a bridesmaids dress from the year before. A lot of the girls in her class did the same sort of things -- recycled a dress, or shopped in friends' closets, but had hair done, or nails. As far as the hair went, for most of the girls it was sort of a prom style -- updos with ringlets or fancy treatments. Oddly I remember being given both a new dress AND hair professionally done for my 8th grade graduation, but didn't have either a new dress or hairdo for highschool, college, or my first wedding, so go figure. I'm kind of amazed at the level of anger you have over a $35 expenditure. Is it because it's for something ephemeral (like a restaurant meal?) or frivolous (like a trip to Disneyland?) Because she wants something that all her friends have (which is pretty much the definition of being a 13-year-old)? Or just because it's something you don't personally value? How would you feel if she asked for $35 for a singing lesson, or a science project, or a theater ticket? Would there be the same amount of outrage? If there's this much emotion around this subject, it's not about the money, and it's not about the hair. Maybe it's about her growing up and becoming a person who doesn't share all your values. In any case, her wanting a special hairdo for a special event hardly seems sufficient cause for despair over the state of the culture and Kids These Days. Gee Shan, I have exact opposite problem with my soon-to-be eighth grade grad - she wants NOTHING. She doesn't want to go to the party, she doesn't want a new dress ("I'll just wear the same one my sister wore when she graduated") - nada. Her goals are for the summer, where she wants to be a PA for Girl Scout camp, where she wants to enjoy a week at their favorite summer church camp and where she is finally a confirmed member of our church and gets to go with the other youth on a mission trip to Denver sans her parents! As a parent, we have clearly defined rules about wants and needs. The kids know the difference. An up-do "like all the other girls" would definitely be in the WANT category, and they would have to pay for it themselves. If they don't have the money, they earn it. I will drive them to, say, one of my friends' houses to help her with her garden at $5/hr. so she can earn her funds - but, I will not give in to a WANT. To my husband and myself, effective consumer decision making is something we started teaching our children when they were VERY young. They all have good heads on their shoulders, and we expect them to use those little spongy brains to understand and be effective consumer decision makers. There is no such thing as entitlement in our house. I didn't have my hair done for 8th grade graduation, but I have for almost all special events since. And actually, it was always my mother's idea (and she paid). She hates "updos", but believes that a blow out is appropriate for all events. Even now at age 29 and working in publishing (which is to say, no money), I still splurge for birthdays and weddings. I go to the Aveda Academy near me, and it's $15 for a junior student to blow dry. Maybe takes a little longer, but the result is the same. I don't think that 15 plus years of blowouts have made me any less self-reliant when it comes to self-care. It just means that I know my limits (and I don't have the tools, patience, or friends to achieve a smooth blow out) and I can appreciate a treat once in a while. Doesn't strike me as particularly surprising, though I agree it's not necessary. I can't stand having my hair done professionally, but it's easier to come to our own conclusions about those things as adults, you know? In the 8th grade, if that's what my peers had been doing, I'd absolutely have wanted to do it with them. Impossible to believe she's so grown up already, though! Like the others, I'm curious as to how you handle this one as well. Personally, the entitlement thing would get my fur way up. I recently forked over $35 to get my son's hair colored green at the salon, so obviously I'm willing to pay for fun hair. But the "do something because everyone else does it" thing is totally unacceptable to me. I guess if it were me I'd ask her what she thought the stylist could do that she couldn't do with Hair Skillz friends/relatives, and then if her answers are valid, make her work for it. Just my $.02 though. She's so gorgeous that I have a hard time believing she wouldn't look just as beautiful for free. Food Tolerance Win: Saag Paneer!